I awoke at 4:30am with the alarm in a (Y)Ouray, Colorado hotel. Got on the computer to check the weather and noted clouds moving out of the area. Peeked out the window and there was snow on the ground as forecast. The plan was to shoot the valley near the foot of County Road 7 but I wondered if it made sense with snow on the ground and that dirt road. Still, I travelled quite a distance for this so I wasn’t about to give up without trying; what’s more, I had the ten essentials in the car and a full tank of gas. Got my things halfway together and went out to check on the Subaru. Well it was covered with snow which took about 15 minutes to clear away. Freezing at this point, I decided I would just get the car running and head out. Thankfully the snow had stopped blowing as I drove off. When I got to Dallas Creek Road I almost drove past it since the sign was partially snow covered. The muddy/snow covered road was soggy and slippery in places and of course it was dark. Another car had blazed the trail before me and I simply followed in their tracks. Upon arriving at the little valley near the end of the road, again, I almost drove past in the darkness. Got a parking spot and waited about 20 minutes for the light to emerge. 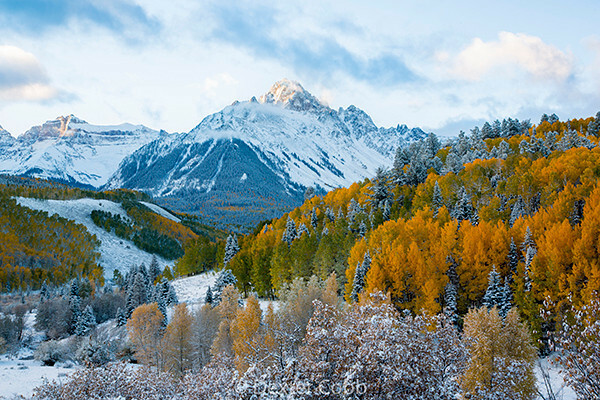 Started shooting in civil twilight and continued for about an hour when Mount Sneffels became completely obscured with cloud cover. This was one of my last shots before the mountain was completely enveloped in cloud cover. It was taken about 20 minutes after the sun cleared the horizon. It was 20 degrees out there that morning and my feet and gloved hands were freezing. But I simply enjoyed the scene unfolding (sky & light changes) before my eyes and could not bring myself to get back into the car to warm up. Thankfully there was no wind to add to the chill factor. Works for me, although I must admit I do get a bit of a chill upon viewing it. No filters were used in the shot.